You'd think that after running for more than a decade I'd have all the clothing and gear dialed in. But I'm far from it. One area where I fall short: socks. They're recognized as an essential footwear component for the serious athlete by the American Academy of Podiatric Sports Medicine, and I know I can't run without them (I've tried but something about bare feet in my shoes only works for walking down the hall to take the garbage out). The wrong sock--or an old sock as I learned at one marathon--can spell failure, blisters and discomfort. The right pair can mean success whether it's a fast time or freeing yourself from blisters. And while I'd like to think that I've found the perfect pair of running socks, for now, I'm always mixing them up. What worked for one or two races, even if they're the same distance, doesn't always work for the next (and I end up with feet full of blisters). But I really don't need a drawer full of almost-perfect socks, nor do I want to buy socks as often as I buy Shot Bloks. If there were a sock exchange program I could buy into (try a sock, send it back if it doesn't work, experiment with different brands and styles), I'd be the first to sign up. Until then, I'll try all the free socks I can get my feet into. Like Swiftwick, the company that is giving away pairs of high-performance compression socks. Runners and athletes can score this deal by downloading a coupon and cashing it in at participating Fleet Feet Sports and Runner's High 'n Tri stores. Swiftwick wants runners and athletes to see the benefits of compression socks first-hand, and the coupon will get you either a free pair or buy-one-get-one free. Their socks offer a patented moisture management feature, a sculptured footbed for maximum comfort and no blisters, and graduated compression, all of which can extend your endurance and performance. The Sustain model is earth-friendly, made from post-industrial recycled nylon (I'm all for reducing carbon footprints especially when it's through something as unintentional as running gear). And my personal favorite: These socks don't stretch all the way up your calves like some socks that bear the "compression" label. I'm all for the calf adornment, especially if it's a cold day, but I'm an ankle-baring runner more than anything. But like all good things, this deal comes to an end on April 19. Perfect timing for me...my next race isn't until the end of the month, and my regular race socks are starting to show some wear and tear. Do you have a favorite pair of running socks? 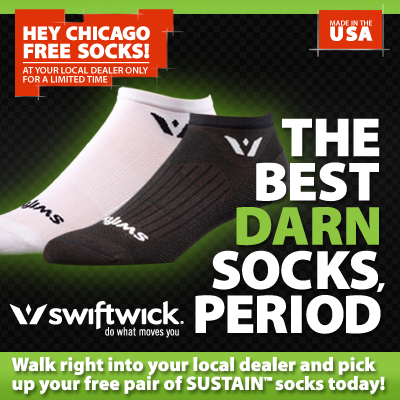 Have you tried Swiftwick socks?